Want to add a Rear Spoiler to your Dodge Charger? Adding a rear spoiler (more correctly rear wing) on a muscle car, such as the Dodge Charger, has a few advantages. First, and most notable, is the cosmetic upgrade. Our many different sizes, paint option and designs can help you personalize your Dodge Charger to your taste. Second is performance. A Dodge Charger rear wing typically helps push the car down while driving at higher speeds to allow greater stability. This is why race cars have those huge wings, and so does the top of line Dodge Charger SRT8. 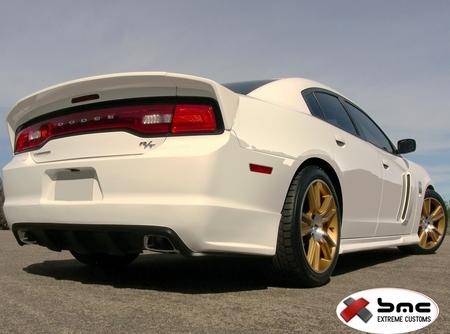 Our Dodge Charger Spoilers are made to fit the SRT, SE, RT, Bumble Bee, and much more. So go ahead and add that spoiler to your ride, remember it not only looks good, but it's functional too.